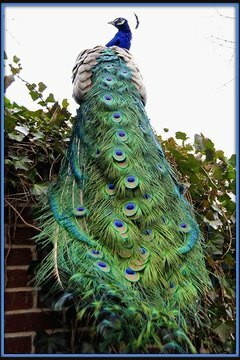 Peacocks are well known for their colorful plumage but the word peacock actually refers to the males of the species. Females have feathers that are more suited to blend in with the surroundings. Females of the species are referred to as peahens. Peafowl is a collective term that refers to peacocks, peahens and peachicks. The San Diego Zoo states that a group of peafowl is called a ostentation or a pride. Peafowl are members of the pheasant family. There are three species of peafowl that include the Indian, green and Congo. The Congo peafowl is listed as endangered. Male peacocks use their long trail of tail feathers to attract females. They use their short, stiff feathers to prop up the long train into a fan shape. Peafowl are ground feeders that eat insects, plants, berries, grain and small creatures such as reptiles and mammals. The Indian peafowl is the national bird of India and has a protected status in that country. Do the Colors of a Male Peacock Help Them Reproduce? How Does a Hummingbird Protect Itself?